Western Mountain scene, wonderful print in a almost black and white look to it, just enough color to give it the 3 dimension look. The original was made by Paul Lauritz and this would be the original print to the time period (my quess would be early 1900's) . Scene shows mountaineous region with river and almost baren grazed land. Excellent condition, Frame is a nice patina gold and glass covers the print. 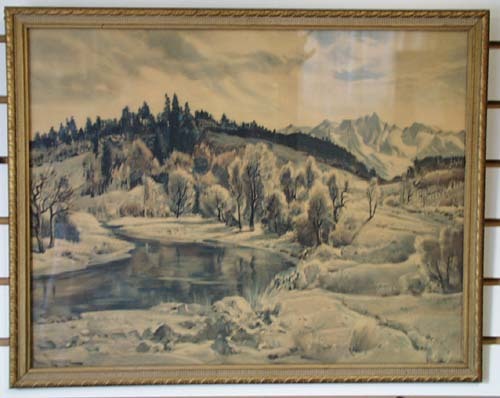 23 1/2 x 19""
Items Similar To "Western Mountain scene, wonderful print"
1924 large Print of snow covered mountains. Kitchen Scene framed print showing fruit and bottles.